A smaller growing tea tree, Leptospermum flavescens ‘Cardwell’ makes an excellent feature plant in the garden and can also be used a low hedge or screening plant. 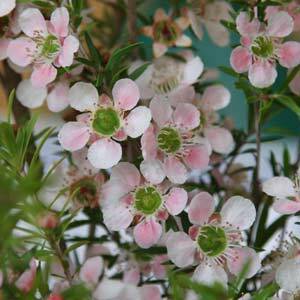 This is a very attractive shrub, a Leptospermum with masses of pink or white flowers from winter through to spring. The stems have a natural arching or weeping habit and given a little room it looks very graceful as a stand alone feature tree. The flowers form right along the arching stems which adds to the overall appearance. Very hardy and tolerant of a range of conditions, this is a low maintenance plant well suited to a range of landscaping uses. Suited to mass planting in commercial landscaping projects. It is the ‘Cardwell’ form that has the best weeping habit and is therefore the most sought after. Once planted and established little extra care is required. A little slow release native plant fertiliser in spring will improve performance. Avoid digging around the root system as all Leptospermums resent root disturbance. Flowering is best in full sun, deep shade will restrict flowering significantly. Height – Will reach 1.5 to 2m in height. Spread – Arching stems to around 2m. Position – Full sun to a little light shade for part of the day. Soil – Humus rich well drained soil, however Leptospermum flavescens ‘Cardwell’ will tolerate poorer sandy soils and short periods wet soils. Frost tolerant -Very mild frosts only. Flowers – Pink or white cup shaped flowers, colour depending on the form. Flowering Time – Winter through spring to summer. Foliage – Mid green, linear and aromatic when brushed against.